Mettâtations are not free, yet. Someday they will be, but starting up this movement does and has cost us a lot of time and money. So, please help us by purchasing or donating so that we can continue to develop and produce new Mettâtations. We need to earn money so that we can develop more mettatations, develop and maintain the smartphone apps, develop and maintain the website, etc. Helping to support us will let us bring you more mettatations and other beneficial things to you in the future. Please help us help others by donating and/or purchasing a mettatation or two. Thank you. 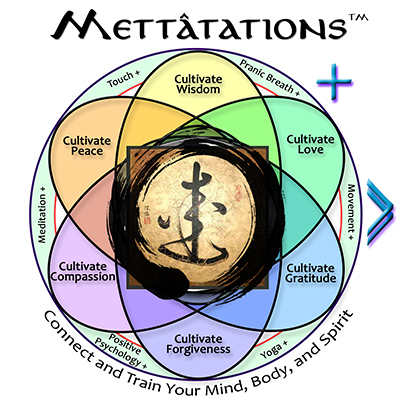 Mettâtations™, and Mettatations™ referred to as "www.Mettatations.com" at its sole discretion, may change the terms, conditions and operation of this website at anytime. By using this website and/or services provided by Mettâtations, the user agrees to the terms of this disclaimer and further waives any rights or claims it may have against Mettâtations. The applicable Web site or sites are referred to herein as the "Site." By accessing the Site, you indicate your acknowledgment and acceptance of these Terms of Service ("Terms"). Please read them carefully. IF YOU DO NOT WISH TO BE BOUND BY THESE TERMS, YOU MAY NOT ACCESS OR USE THIS SITE. The content, including all mettatation audio recordings, video recordngs, descriptions, scripts, available through the website is the sole property of Mettâtations or its affiliates and is protected by U.S. and International patent, copyright, trademark and other intellectual property laws. Except as otherwise explicitly agreed in writing, content on this website and affiliate websites may not be reproduced, retransmited, distributed, disseminated, sold, published, broadcast or circulated to anyone without Mettâtations's express prior written consent. ALL METTATATIONS ARE PROTECTED BY U.S. & INTERNATIONAL COPYRIGHT LAWS AND MAY NOT BE COPIED, RECREATED, REPRODUCED, ALTERED, REWRITTEN, AND/OR MODIFIED WITHOUT EXPRESS WRITTEN CONSENT OF Mettâtations. THIS INCLUDES AND IS NOT LIMITED TO DERIVATIVE WORKS. You shall use the Site for lawful purposes only. You shall not post or transmit through the Site any information or material which violates or infringes, in any way, the rights of others, or which is unlawful, threatening, abusive, defamatory, invasive of privacy or publicity rights, vulgar, obscene, profane, harassing, or otherwise objectionable. Nor shall you post or transmit through the Site any information or material which encourages conduct that would constitute a criminal offense, give rise to liability or otherwise violate any law or administrative ruling or guidelines, is in violation of these Terms, or which, without Mettâtations's prior written approval, contain advertising or any solicitation with respect to products or services. Any conduct by you that, in Mettâtations' opinion, restricts or inhibits any other user from using or enjoying the Site will not be permitted. Although Mettâtations has attempted to provide accurate information on its web site, Mettâtations assumes no responsibility for the accuracy of the information. Mettâtations may change the products or services mentioned at any time without notice. Product specifications, prices, and product availability are subject to change without notice. Mettâtations and it's owners, officers, employees, and/or affiliates shall not be liable for direct, indirect, special, punitive, consequential or incidental damages including, without limitiation, lost profits, royalties or revenues, costs of replacement goods, loss or damage to data arising out of the use of or inability to use this site or any Mettâtations product or service and damages resulting from use of such. All information, products, and services provided and available on www.Mettâtations.com are provided 'as is' without warranty of any kind, either express or implied, as to the operation of this website or the content or products included on this website. Mettâtations does not and will not sell or share your e-mail address or contact information with anyone under normal circumstances. In the event of illegal activity, we may provide local, state, and federal officials with information to investigate any alleged crime. www.Mettâtations.com contains links to third party sites. Access to any other website linked to this site is at the user's own risk. This website is not responsible for the accuracy and/or reliability of any information, data or statements made on these sites, or for the privacy policies followed by these sites. Mettâtations provides these links merely as a convenience and the inclusion of such links does not imply an endorsement. YOU ACKNOWLEDGE AND AGREE THAT AT NO TIME IS Mettâtations MAKING ANY REPRESENTATION OR WARRANTY REGARDING ANY THIRD PARTY'S PRODUCTS OR SERVICES, NOR WILL Mettâtations BE LIABLE TO YOU OR ANY THIRD PARTY FOR ANY CLAIMS ARISING FROM OR IN CONNECTION WITH SUCH THIRD PARTY PRODUCTS AND SERVICES. YOU HEREBY DISCLAIM AND WAIVE ANY RIGHTS AND CLAIMS YOU MAY HAVE AGAINST ENOM WITH RESPECT TO THIRD PARTY PRODUCTS AND SERVICES, TO THE MAXIMUM EXTENT PERMITTED BY LAW. Anyone linking to Mettâtations Site must comply with Mettâtations guidelines for linking to Mettâtations Site and all applicable laws. Webbots, Spiders, and Spam: Spam is illegal, and any webbot, spider, or program used to harvest e-mail addresses from Mettâtations are prohibited. You agree that you will not use any robot, spider, other automatic device, or manual process to monitor or copy our Web pages or the content contained herein without our prior expressed written permission. You agree that you will not use any device, software or routine to interfere or attempt to interfere with the proper working of the Site or any transaction being conducted on our Site. Please verify that spam or any other e-mail filters allow e-mail from Mettâtations.com. User agrees to indemnify and hold Mettâtations and it's affiliates, officers, agents, suppliers or other partners, and employees harmless from any claim or demand, including reasonable legal fees, made by any third party due to or arising out of your use of this site or its products or services or your violation of these terms. If in any event a claim is brought against, buyer must first contact Mettâtations to resolve any claim. If, in the event any unresolved claim appears to be outstanding, further legal venue will be in the state of South Carolina, in the municipality of Charleston or by such having jurisdiction. You agree that regardless of any statute, regulation, or law to the contrary, any claim or cause of action arising out of or related to use of the site or the Terms must be filed within one (1) year after such claim or cause of action arose or be forever barred. This page and associated links on this website, constitute the terms of the entire agreement, and no oral modification may be amended to these terms by anyone. For questions regarding any of these terms, please contact Steve@Mettatations.com.